AJ Odudu would be a pretty smart character to choose for any brand. The boundless energy and vivacity that brought her to the Channel 5’s attention for her presenter work on Celebrity Big Brother is born out of Blackburn, with all of the positive clichés of ‘down to earth’ and approachable that her proudly Lancastrian background implies. Today, we chatted just moments before she took on a performing role in one of Manchester’s big events of the year, when 30,000 runners turn out for the city’s Great Run series half marathon and 10K races. AJ was getting her muscles and mind fired up to be a one-hour pacer in the 10K, one of a team of pacers that promote Duracell and help other runners to achieve their goals. It will be an emotional day for the runners and an exacting and exhausting one for the city authorities, under intense media scrutiny, making sure of everyone’s safety. A day, all round, for the indefatigable, in body and spirit. Today, AJ will be a Duracell Bunny pacer, one enlivening element of an ongoing sponsorship activation commitment from the brand. That brand push will be amplified by its social media presence of course, via #runforlonger and AJ is certainly and online star. She has her own website, but her preferred dynamic is Instagram – @ajodudu, which she tells me is a regular ritual. Relatable is a good word for AJ. She has surely been added to the Duracell team to reach out to a younger demographic than me, but even though I was outside the target, she was immediately engaging. “I’m super-excited for today,”, she says, “I feel like I’ve got so much energy”. Since running London Marathon in April, some of AJ’s recent training programme has been dedicated to the pacer task. Duracell runners have to run within themselves and brandish as big flag as they go, so training to pace is vital. A recipient of a number of branded products and endorsements, AJ is unsurprisingly on message when it comes to both Duracell and the broader picture of the role that brands play at events. “For Duracell, it’s a very positive partnership. Today is about everyone running in the same direction with the same goal,” she says, AJ came to Duracell’s notice when running in the same event last year. She lives in London, but loves to tap the Northern vibe that takes her back to her roots. “It is a great event for brands, and brands have the ability to expose health and wellbeing,” she says. Olympic legend Daley Thompson once told me something similar about how he values brand reach when it drives the sports and health agenda forwards. Duracell’s partnership with AJ has extended beyond the day of the event itself, so that, she says “we have had training runs together”. As event prep is a key part of AJ’s fitness messaging, this makes the partnership more dynamic and meaningful. 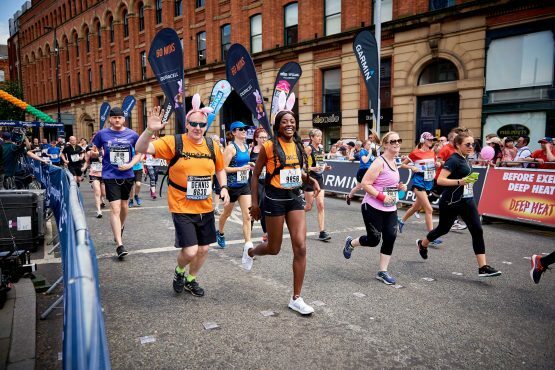 She kick-started the campaign by inviting members of the public to join her at a special Great Run Local event in Salford Quays where she provided her top training tips. After today’s glimpse into AJ’s personality, you’d feel confident she would connect one to one at an immersive event, just as readily as she does to camera. “I think for Duracell, I bring exposure to a younger audience and the health and well-being community”, she concludes.